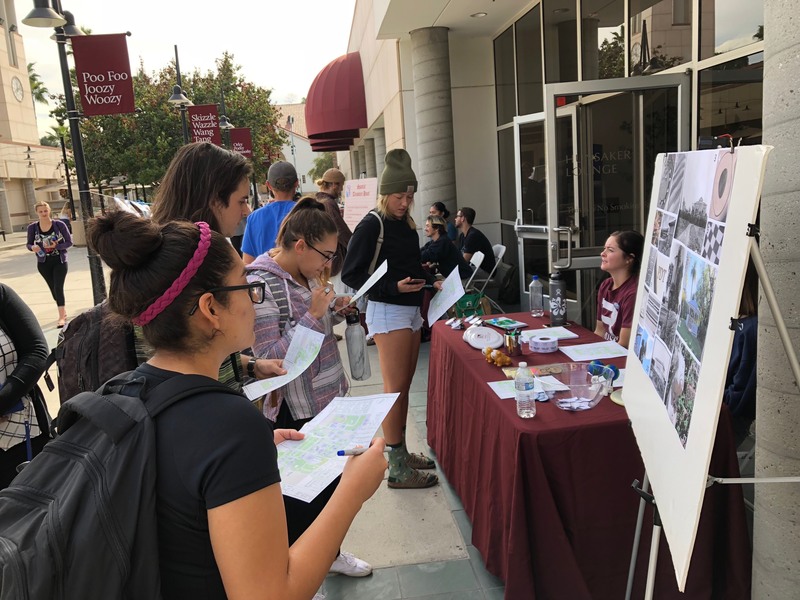 The University of Redlands is a spatial university, meaning that spatial thinking is integrated into a broad spectrum of coursework, research, and administrative functions at the institution. So, it’s no surprise that Geography Awareness Week (“Geoweek” ) would loom large at the University of Redlands. Established by President Reagan’s proclamation in 1988 and organized, annually, by National Geographic, Geoweek encourages people to think and learn about why “place” matters and how we influence, and are influenced by, the places in which we live. College of Arts and Sciences undergraduate students Ely Hienrich and Harrison Cannon, Esri Campus Ambassadors and summer 2017 interns at Esri, shared their insights during the “An Insiders’ View on Esri Internships” workshop on Monday, November 13. Workshop participants learned about what it’s like to work at Esri, special programs Esri puts on for summer interns, and how to apply for Esri internships. On Tuesday evening, November 14, Lauren Bennett, Esri’s lead product engineer for spatial statistics, presented “Space Time Pattern Mining, A New Frontier in Spatial Analysis” as part of the Center for Business GIS and Spatial Analysis speaker series. Her talk focused on the quantifiable insights that can be gained from space-time cubes developed in Esri’s ArcGIS Pro software. At the “GIS Day Showcase and Drone Demo” presented in the Hunsaker Center on Wednesday, November 15, participants played spatial games, learned about ocean currents from EVST professor Hillary Jenkins’ rotating tank demonstration of fluid dynamics, and learned about the University’s spatial degrees, programs, and centers. Tom Horan, dean of the School of Business, capped off GIS Day with his Redlands Forum talk: “Business Liberal Arts for the 21st Century.” Speaking from the stage at the center of Esri’s Redlands campus, Dr. Horan delivered a compelling case for GIS at all levels of business education. On Thursday, November 16, University of Redlands alumnus Jakob Larson ’18 conducted a “BioBlitz” at the Oak Glen Preserve and Southern Montane Botanical Garden. This hands-on GIS event provided species diversity data to assist Larson’s role as GIS Manager and Climate Change Analyst for the Wildlands Conservancy. Spatial students consumed pizza, cookies, and soda while they aided relief efforts in Bangladesh during a “Humanitarian Mapathon” held in Lewis Hall on Thursday, November 16. The students mapped rivers, roads, and other geographic features in this crowd-sourced data gathering event. 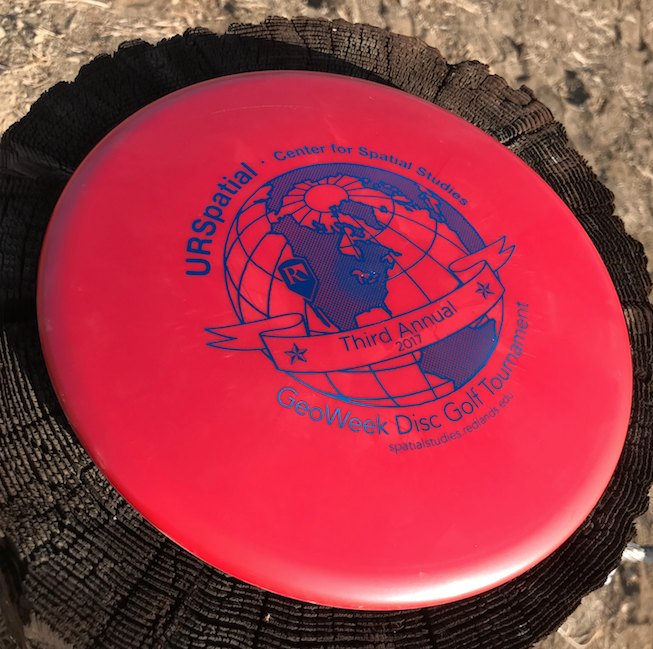 Capping off Geoweek 2017 was the Third Annual Disc Golf Tournament held on Friday, November 17. Students, faculty, administrators, Esri personnel, and other community members demonstrated their spatial thinking and disc flipping skills in this popular sporting event. Geoweek 2018 will be held the third week of November next year. Keep track of spatialstudies.redlands.edu, facebook.com/urspatial, twitter.com/urspatial, and Instagram.com/urspatial for postings about the event.